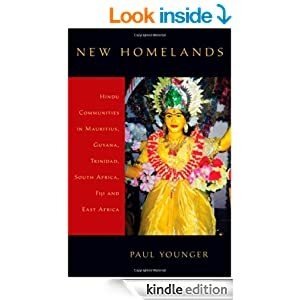 Finished reading "New Homelands" by Paul Younger. This is a study of Hindu communities in Mauritius, Guyana, Trinidad, South Africa, East Africa and Fiji. These were former British colonies which had together imported about 1.1 million indentured laborers from India, the majority being Hindus. The Guyana section of the book is interesting. It shows how the South Indian/Madrasi Tamil-and-Telugu-speaking Hindus developed their temples and worshipping methods differently from the mainly Bhojpuri-Hindi-speaking North Indians. I learned something important about the Guyana Pandits' Council and my attitude to it has changed. I now understand the crucial role the Pandits'Council played in securing the overall interests of Guyanese Hindus before independence and why it afterwards chose cooperation and not confrontation with the PNC regime. I wish to thank the GNI member who voluntarily sent me a PDF copy of this enlightening but expensive book. He knows who he is.